Cobra Sport Cat Back System (Non-Resonated). Vauxhall Astra H 1.9 CDTI. Pipe Diameter: 2.5 (63.5mm). There are multiple tailpipe choices available for this product. More information on each tailpipe option can be found below. 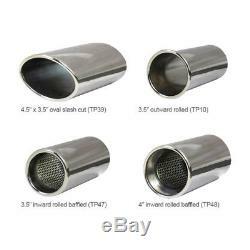 Please message us with your choice of tailpipe when placing your order. 4.5" x 3.5" Oval Slash Cut. 3.5 Inward Rolled (Baffled). 3.5" Outward Rolled (4"). Cobra Sport performance exhausts enhance the sound, looks and quality of your vehicle giving you the ultimate driving experience. This Astra CDTI performance exhaust is made in 2.5/63.5mm pipework and fit from the catalytic converter section backwards (Cat Back) these exhausts replace the centre and rear sections. This non-resonated sports exhaust makes the system louder as it excludes the centre silencer and therefore, has a sportier exhaust note. This exhaust however, is also available as a resonated version (including centre silencer) which is a quieter option. All relevant fittings and gaskets are supplied. 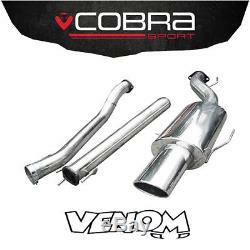 The item "Cobra Exhaust 2.5 Cat Back System Non-Resonated Vauxhall Astra H 1.9 CDTI VX78" is in sale since Saturday, September 2, 2017. This item is in the category "Vehicle Parts & Accessories\Car Tuning & Styling\Performance Exhaust\Complete Performance Exhausts". The seller is "venommotorsport" and is located in Preston. This item can be shipped to United Kingdom.